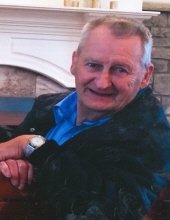 Paul Junior Hale, 78, of Crab Orchard, passed away Friday, October 5th, at his home. He was the husband of Julie Ann (Denny) Hale whom he married on March 16, 1968. Paul was born in Owsley County, Kentucky on April 2, 1940. He was a son of the late Vadis Lurman Hale and Beulah (Tackett) Hale. He had worked as a School Custodian at Brodhead Elementary School. He had also worked for the York Casket Factory for 17 years. Paul had attended the Philadelphia Baptist Church and was a veteran of the United States Army. Several Nieces & Nephews also survive including a Special Niece Phyllis Holcomb. In addition to His parents, Paul was preceded in death by Stepmother, Laura Hale & Brother, Doug Hendershot. Visitation will be prior to the funeral service on Monday beginning at 11:00 am at McKnight Funeral Home. To send flowers or a remembrance gift to the family of Paul Junior Hale, please visit our Tribute Store. "Email Address" would like to share the life celebration of Paul Junior Hale. Click on the "link" to go to share a favorite memory or leave a condolence message for the family.